Quarkstollen or Dresden Stollen ? My friend Marion shares how we celebrate Christmas. 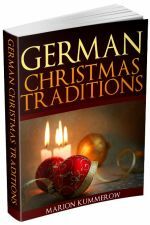 You can argue whether the stollen recipe with curd cheese (Quarkstollen), or a yeast stollen, based on the original Dresdner Christstollen, is the better German Christmas cake. In my opinion, it is just a point of personal taste. I for one, definitely favour the Quarkstollen. The tradition of Christmas stollen goes back to the 14th century, although the first stollen were rather simple, not as rich as they are today. The famous Dresdner Stollen is a yeast-based cake, rich and moist. Originally, it was called "Strietzel", and the Christmas market in Dresden is still the Strietzelmarkt. 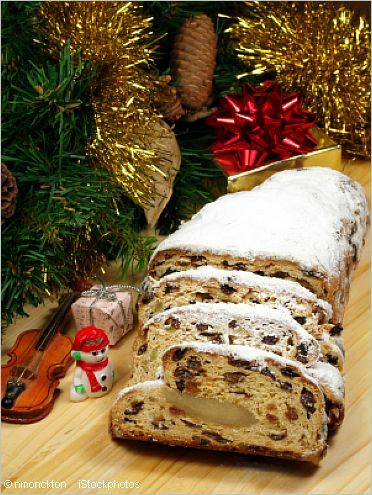 Since the German reunification Dresdner Stollen is a registered trademark. An "Original Dresdner Stollen" must be produced by one of the about 150 bakeries in and around Dresden. My stollen recipe is not so old, of course:). However, it has been used in our family for more than 60 years. It is a Quarkstollen recipe and very delicious. Try it! Soak the raisins in rum for 24 hours. Drain the curd cheese in a fine sieve for an hour. Drain the raisins, you can keep the rum and add it to the stollen. Beat the eggs in a large mixing bowl, then add one ingredience after the other while continuing mixing: sugar, soft butter, lemon flavour essence, curd cheese and the rum if you kept it. Add almonds, candied orange peel and candied lemon peel. 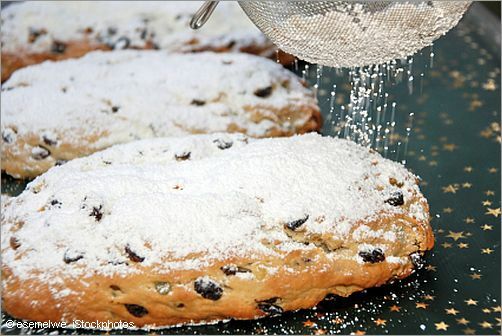 Mix baking powder with the sifted flour, slowly add half of the flour to the stollen mixture using kneading hooks. 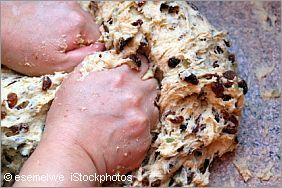 When the dough becomes too firm to handle with the mixer, add the rest of the flour and the raisins and knead the stollen with your hands until well combined. Put the dough on a floured surface, flatten it and fold one half over to form one large stollen, put it on a piece of greased aluminium foil and form an edge with the foil. OR divide the dough into two halves and fill two greased stollen pans. Bake the stollen in a pre-heated oven at 180°C / 350°F for about 70 minutes. One large Quarkstollen needs longer in the oven than two small ones. During the last ten minutes in the oven, brush the stollen with melted butter a few times . 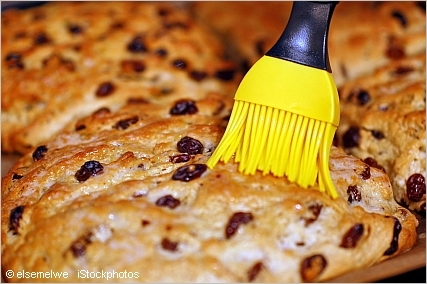 Poke a thin metal stick into the stollen, when the stick comes out clean, remove the stollen from the oven. Cool the stollen on a cooling rack, then dust it with icing sugar. Leave it on the rack for a few hours. When the stollen is cold, wrap it in grease proof paper first, and then in aluminium foil. Use a kitchen scale for best results, or see my flour facts and gram to cup convertion page for tips. Dust the drained raisins with a little flour before you add them to the dough. This prevents that the raisins sink to the bottom of the stollen during the baking process. If you don't like the coarse orange and lemon peel, use a food chopper to get smaller pieces. Choose one of the decorative tin chests filled with delicious ginger bread and you'll have a perfect Christmas gift for your family & friends, or for yourself. Disclosure: Some links on this page are affiliate links. This means when you buy a product through one of these links, for example at Amazon.com, I earn a small commission (there is no extra cost for you). This money helps me to maintain this website and provide the free information for you. Thank you in advance for your support.